Read the original post on www.theoaklandpress.com. There’s been a recent trend in the video game industry of companies collecting, anthologizing, and remastering their classic titles to re-release on modern platforms. “Mega Man Legacy Collection” is part of a new breed of anthology that isn’t content to update a classic, but instead seeks to honor its history. And with Capcom’s iconic little blue robot, what a history it is. I initially was skeptical of the need for another Mega Man collection, especially after 2004’s similarly-named Mega Man Anniversary Collection featured the first eight Mega Man games, whereas Legacy Collection has only six. But this version learns from the missteps of its predecessor, focusing on perfectly recreating the original NES games and contextualizing them with a plethora of background information in its museum section. And thankfully, Legacy Collection will let you customize your controls to fit modern controllers. Some re-released games try to sand the rough edges off a title in light of modern conveniences, like publisher Capcom did when they offered up an easier control scheme for the PC version of Resident Evil earlier this year. Legacy Collection instead tries to emulate those original 6 Mega Man games with slavish devotion to accuracy; no quarter is given to new players who might be unfamiliar with the old school challenge. Veterans can rest assured that the original difficulty is still there, as are all the weird glitches and bugs that occasionally made things easier. New players can expect to die — a lot — as they learn the ropes. That’s not to say there are no new features to speak of. All six Mega Man games can be played with special screen filters that try to recreate the dot matrix or scanlines of the picture tubes of the ‘80s and ‘90s. Players who don’t understand why the 4:3 ratio picture doesn’t fill their widescreen 21st century TV have the option to blow the image up to fill the screen, although it’s not clear why you’d want to, as the picture quality is terrible like this. One concession made to the 8-bit difficulty is the addition of save states. You can save the game anywhere you like and then reload from that exact point at will, allowing players to effectively have infinite lives. It also obfuscates the need for the antiquated password system, though if you have some 20-year-old passwords from the original games, they’ll work here too. However, unlike another recent gaming collection, Microsoft’s “Rare Replay,” none of these games allow you to rewind time to redo a particular botched jump. One thing Legacy Collection shares in common with Rare Replay is an exhaustive museum section for each game that includes in-game concept art, character sketches, and even a few oddities like a scan of a rebate coupon that came in the original packaging. The library also presents a bestiary with descriptions and strategies for every enemy in the games. For the Robot Master bosses, you have the option to do a practice fight straight from the menu, and the library is even nice enough to give you the weapon that the boss is weak against. You’ll need to do a lot of those practice runs to conquer the bonus challenge missions. One such challenge requires you to beat a gauntlet of every boss across all six games, 46 in total. Even players who know the original games back-to-front will have their hands full conquering all the extra challenges. I would’ve liked to see more information about the actual development of the originals as we saw in Rare Replay, but Japanese developers are rarely so forthcoming with inside information. As we can see in the credits, at the time these games were made, the programmers were not even allowed to use their real names! A cynical person might say that the recent rash in the game industry of rehashing old content is symptomatic of publishers being afraid to try new ideas and instead leaning on the tried and true titles of the past. 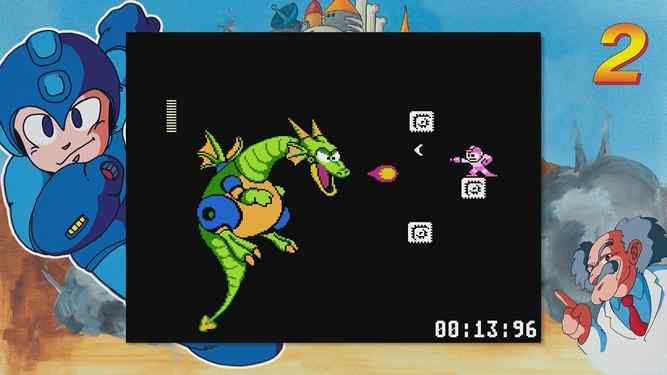 Mega Man Legacy Collection shows what a collection should be: rather than a simple cash grab, a gaming collection can be a way of preserving and contextualizing classics for a new generation to try, in an industry where old games are too easily lost to time. At a cost of $14.99, the collection is a great value, especially when you consider that each of the games in it are sold individually on the Nintendo eShop for $4.99 each. Developer Digital Eclipse’s devotion to the source material is apparent, and I hope to see them tackle the SNES entries in the Mega Man franchise in a Volume 2 sometime in the future. If you were ever a fan of Capcom’s blue bomber, or if you’re a younger gamer who wants to see what all the fuss is about, give this one a look. Mega Man Legacy Collection is available for purchase digitally on Steam, Xbox One, and PS4 for $14.99. Publisher Capcom provided a review code for the purposes of this article. This entry was posted in The Dialogue Tree. Bookmark the permalink.